Timucua The Timucua Indians were spread across parts of northern Florida and southeastern Georgia. Their territory was large and consisted of many different environments. Beaches, salt marshes, and forests thrived near the Atlantic coast. Rivers, lakes, swamps, and woodlands covered inland areas. The Timucua were not a single tribe, but rather separate groups, who spoke dialects or types of the Timucua language. For example, the Mocama dialect was spoken by the coastal Timucua near Jacksonville, while the Potano dialect was spoken by the inland Timucua near Gainesville. Because of Florida’s hot climate, the Timucua wore little clothing. Men dressed only in deerskin breechcloths. Their long black hair was tied in topknots, and their faces and bodies were decorated in brightly colored markings. Some of these tattoos were permanent, while others could be washed away. Women wore skirts of Spanish moss. Their long hair hung loose down their backs. Some women also had tattoos. Both men and women wore bracelets and necklaces of animal bone, teeth, and shell. Colored bird feathers might be placed in their hair during special events. Animal fur capes or robes provided warmth in the winter. 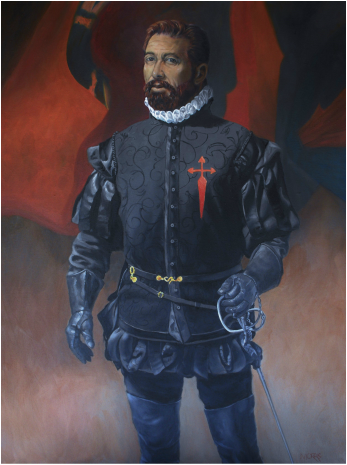 Pedro Menéndez de Avilés (15 February 1519–17 September 1574) was a Spanish admiral and explorer from the region of Asturias, Spain, remembered for planning the first regular trans-oceanic convoys and for founding St. Augustine, Florida in 1565. This was the first successful Spanish settlement in La Florida and the most significant city in the region for nearly three hundred years. 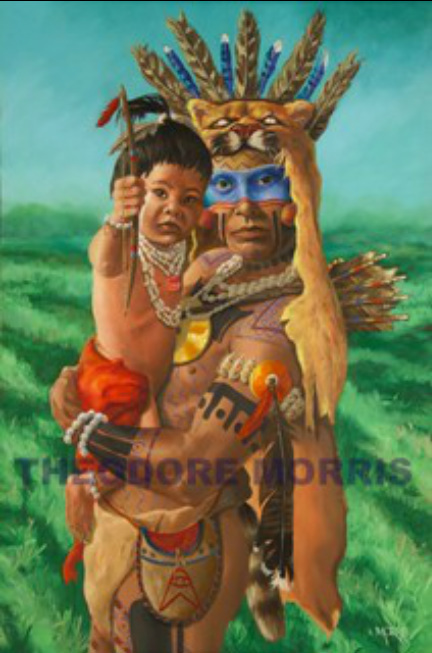 He was welcomed by the chief of the Timucua village of Seloy, where he stayed for a year. St. Augustine is the oldest continuously inhabited European -established settlement in the continental United States. Menéndez subsequently became the first governor of Florida. When the French arrived in Florida in 1564, they brought few available women. The single men sought companionship from single Indian maidens. Neither the native girls nor their fathers opposed matches between an Indian girl and a Frenchman. I painted the background with neutral colors to emphasize the two figures in the foreground. This Timucua chief was described in 1564 by the French artist Jacques le Moyne as being painted red and walking alone in solitary grandeur in the middle of his warriors. I painted a warm umber color in the background to suggest his god-like powers. The turkey vulture in the sky connects spiritually and naturally to the feathers he wears. "...govern their republics as head with the assistance of counselors...determines and reaches decisions on everything that is appropriate for the village and the common good..."
This Queen stands framed against the strikingly beautiful saltwater marshes of Ft. George Island near the St. Johns River. Island living had many benefits including security from attacks by other tribes and the easy gathering of seafood and marsh animals. She is one with her environment as she gazes out from the shady coolness of a shoreline tree covered with ferns. I liked the contrast between the figure and the hot glaring sunlit background. This war leader wears a bobcat pelt on his head that signifies he is a member of the Bobcat Clan. 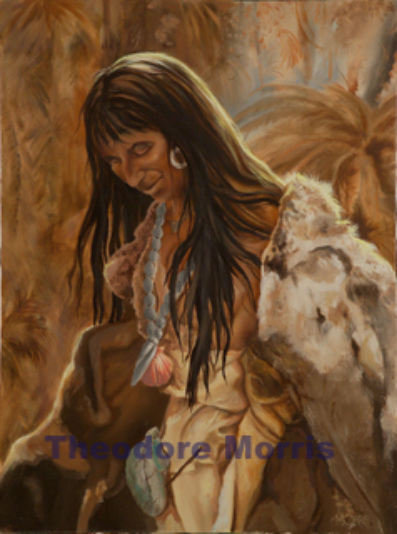 I painted the bright red background and brightly painted deer skin to emphasize the energy still associated with this old tribal member. As he gazes at the viewer, he recalls all the changes he has seen with the arrival of the Europeans. This young woman lived inland from northeast coastal Florida. In the 1560's, a chief was described as using red face paint. Red face paint was one way to recognize a tribal member. The tattoo designs are based on her tribal pottery. I painted the soft muted pastel colors in the background to indicate sky and water. Without a distracting background, I felt the viewer would connect more easily to her penetrating eyes. This maiden gathers coquinas, which will be boiled for a tasty broth. Coquinas are brightly colored bivalves that live in the surf-pounded tidal area of beaches. Their shells make up a large part of some shell mounds on Florida's east coast and along the St. Johns River. 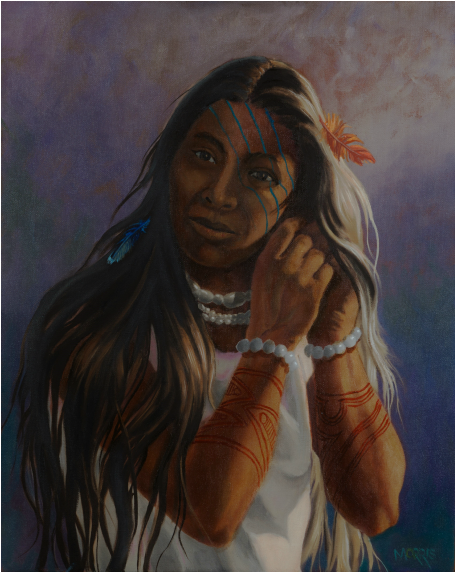 From an artist's view, this panting was one that just fell into place, perhaps because the model I used is an old friend and a professional archaeologist with very long beautiful flowing hair. This painting depicts an Indian family from the interior of northeast Florida as they leave a coastal village. This family has just traded alligator and otter skins for shell beads. Tribes traded with each other all across Florida. I depicted this family in a shallow coastal stream as an example of how these people interacted with their environment. The warm colors convey a feeling of relaxation and peace. This stoic and proud warrior wears a panther headdress as a symbol of high military rank. His son holds a bow with which he will learn to shoot small animals. This training will, in the future, be an important skill for the survival of the tribe. I think all fathers can relate to this painting. This painting has colorful, strong central figures that contrast with the vibrant green in the background. This gives the painting a strong dynamic movement. A fisherman examines his bone arrow point prior to shooting at a fish in the tidal waters of northeast Florida. The arrowhead is secured to the shaft with pine resin and further secured by binding with rawhide strips. I painted the background as a neutral color so the main focus would be on the figure. This painting is a good example how I work on solidity of form to create a realistic image. This maiden covers herself with robes made from deer pelts. Deer were plentiful and a very important source of food, clothing, and other useful items. Deer bones and antlers were used for spear points, eating utensils, fishhooks, beads and many kinds of tools. Having many deer skins to wear was a sign of royalty. I used a lot of brown colors to create a sense of calm and mystery. 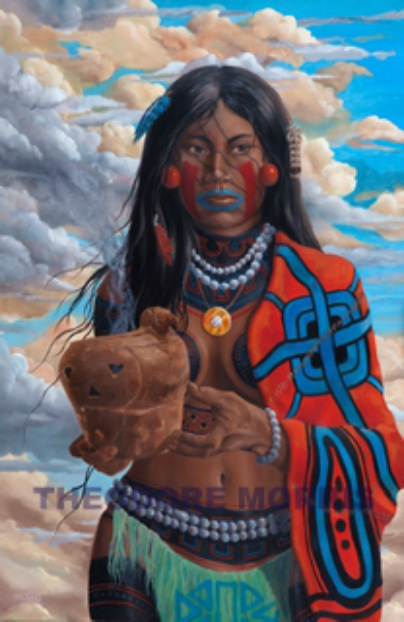 This Freshwater Timucua woman of royalty holds a ceremonial turkey vulture effigy incense burner. This pot has been passed down for many generations. Timucua tribes who lived inland from the sea painted their faces red, while those on the coast used black to paint their faces. In this painting I created a balance between the intellectual and the emotional; the human story around which to build a painting. The viewer can imagine the story. This leader gazes out at his world. 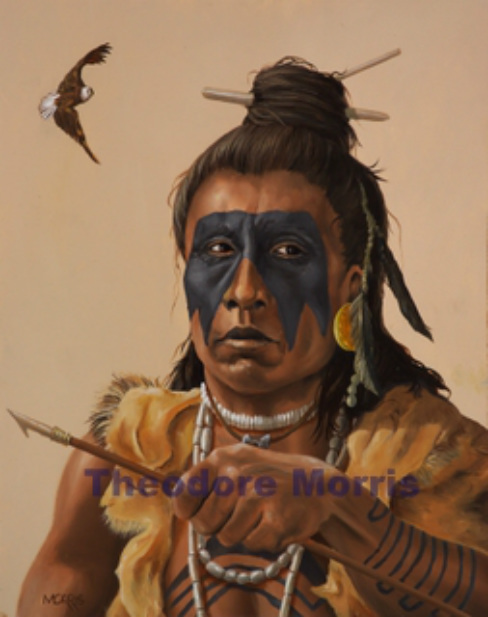 As a clan leader, his courage and experience were critical for the survival of the tribe. I created a simple composition with the strong blue values of the background played off against the rich brown colors of the face. This panther clan member wears a panther skin that infuses him with the power of the Florida panther. His intelligence resonates in the steadfastness of his eyes. I painted the gray background to accentuate the warm glow of this leader. 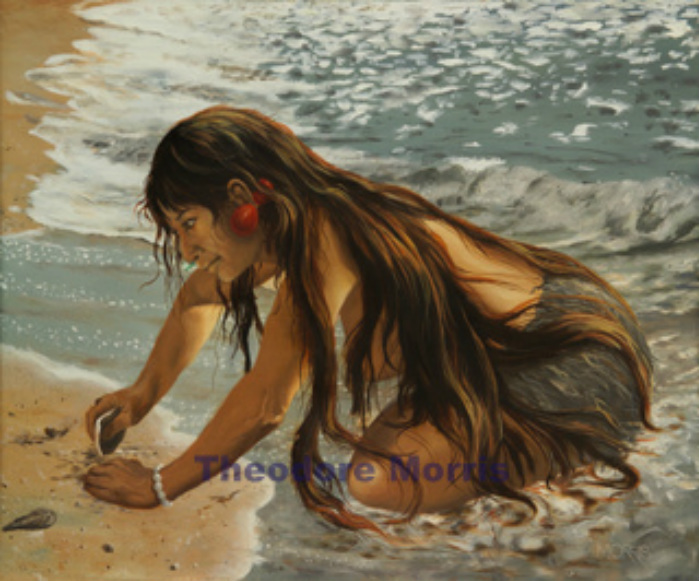 A female Timucua Chief wakes and prepares for another busy day. I created the scene with the strong sunshine of early morn sculpting the figure. Women Chiefs wielded the same power as male chiefs. Women were described by the French as “well favored and modest,” basing the judgement as to their modesty and the woman's disclination to permit Frenchmen to come close to them". 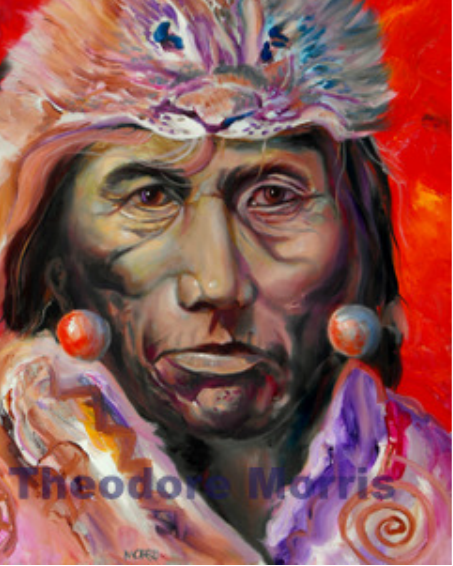 In this painting, I decided to paint a strong tribal leader of the Bear Clan. His wordly experiences are shown in his face, Tribal chiefs worked along with the governing elite, which were hereditary positions. Certain clans were ranked above other clans and had certain duties and responsibilities as well as specific powers. Members of clans were forbidden to marry within the clan. This fierce warrior contemplates battle. His distinctive eagle headdress, brutal war club, pearl beads and shiny copper ornaments indicate his status as a war leader. The racoon tails attached to the back of his breechcloth show his connection to nature. The Tukey feet ear ornaments were documented in early French portraits of the Florida Indians. 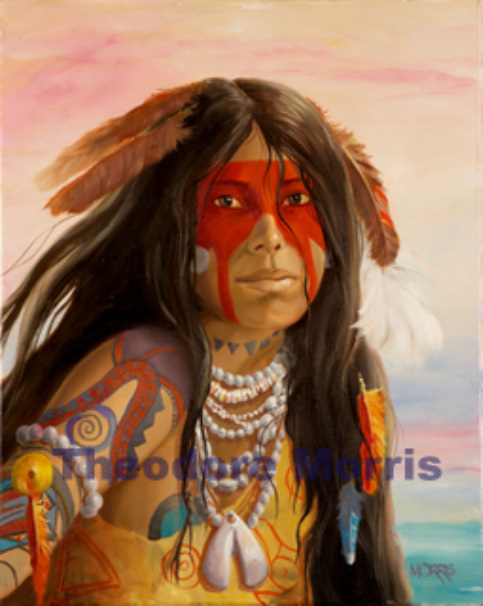 This girl was a member of a Western Timucua speaking tribe. The spider notif was also found with other Florida tribes. 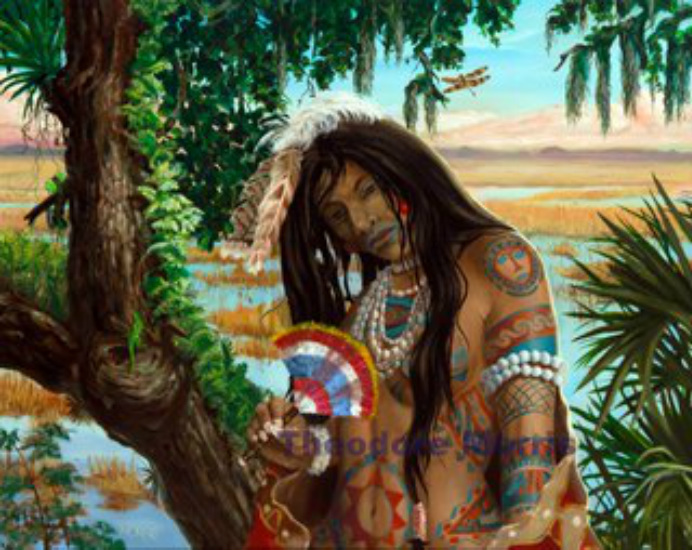 The Cherokee Indian's spider myth. In the beginning there was no fire.There was fire on an island from a lightning strike, and Water Spider said she would get it; so she spun a thread from her body aqnd wove it into a bowl. She crossed over to the island where the fire was burning and put a coal of fire into her bowl and brought it back.